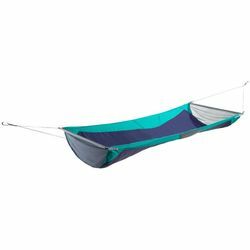 ENO Skyloft Hammock. Eagles Nest Outfitters. The SkyLoft lifts your hammock experience to new levels with an open, airy design using lightweight aluminum spreader bars. Its dual functionality is the key to the SkyLoft’s overall appeal. Using a toggle system, you can switch into “Relax” mode or “Sleep” mode to fit your personal relaxation style - both day and night. The SkyLoft easily packs into its own stuff sack, which also doubles as an integrated hammock pillow. Two stretch nylon pockets keep all your small belonging close at hand while you stretch out in suspended comfort, and the light and breathable NewWave™ Nylon keeps you swaying comfortably on even the warmest summer day.